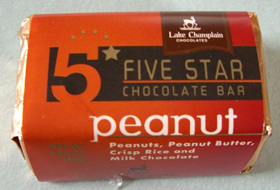 I have been wanting to try a Lake Champlain Five Star Chocolate Bar ever since I read about them in the ultimate candy addict tome: Steve Almondâ€™s Candyfreak . Well, it took me several years, but I finally managed to try one: the peanut Five Star Chocolate Bar. It contains peanuts, peanut butter, crisp rice, and milk chocolate. What’s wrong with that? Nothing, my friends! Unfortunately, the bar just didn’t live up to the hype. I was expecting it to be really flavorful, with that perfect pairing of chocolate and peanut butter with the heavenly light crunch of crisp rice, but actually, it was just kind of meh. I thought the bar would make up for its diminutive size with a wallop of strong flavor, but such was not the case. 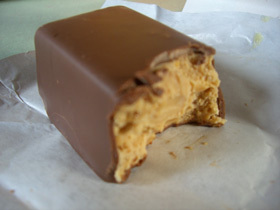 I think the peanut bar would benefit from the addition of chewy caramel and actual crunch–though the bar purports to have peanuts and crisp rice, you can see that the filling is pretty smooth. Steve Almond is still my hero, but I’ll stick with Reese’s Peanut Butter Cups when I need a peanut butter-chocolate fix! If you want a very similar combination of flavors that is actually good pick up a whatchamacallit. It is made by Hersheys and I swear that is its actual name. If you didn’t like the Peanut Five Star Bar, you should try the Hazelnut, or Caramel Five Star Bar. You should also try Lake Champlain Chocolate’s other candy, such as the amazing truffles, which started the company.